North, south, east, west, no matter what direction you choose you will find thousands upon thousands of acres of public land and all of it open to hiking. There are hundreds of marked trails and many more unmarked trails with suitability for every level of stroller, day hiker, back packer and trekker. Hiking provides the perfect opportunity to observe wildlife in a natural setting. The spring brings forth a stunning array of colorful wildflowers. For the birdwatcher there are incredible varieties of songbird, woodpeckers, owls, raptors and more. And there are many areas closed to motorized vehicles allowing one to shed the hustle and bustle of the modern world and find quiet and solitude in an unspoiled setting. Here are some common wildflowers you might see on your hike. Click to download the Local Wildflowers Guide. There is plenty of public land surrounding the lake and you can find several trail markers from the upper lake road. Most of these hikes are short and relatively easy. Hike #1 Denton’s Point Trail (Moderate). One nice trail system that can be used by hikers, horseback riders, 4 wheelers and snowmobilers is above Denton’s Point. Off of Hwy 1 turn onto Georgetown Lake Rd at the eastern end of the lake. Take about 2 miles and make a left onto Lucky Lane. Make 1st right and follow road around to end. Make a left to the trailhead. The trail goes for many miles and you can tailor the distance to your level of fitness and desire. There are some steeper grades, but for the most part to hiking is easy. You may come across deer, elk and moose as well as the occasional bear and might even spot a wolf. Hike # 2 Cable Creek Campground Hike (Moderate). From Hwy 1 turn onto Southern Cross Rd. Bear left at sign to Ski Hill. Look for sign for Cable Creek Campground and make a right. Look for large parking lot on left. In the back of the parking lot toward the left there should be a marked trail. The trail travels up the hill for about 1.56 miles and lets out at the ski hill parking lot or you can cut off to the left onto the road. The hiking is moderate as it goes uphill for most of its length. In the winter this is a cross-country ski trail. Hike # 3 Echo Lake Picnic ground (Easy). Take Southern Cross Road from Hwy 1. Bear left following signs to Ski Hill. Look for sign for Echo Lake and make a left. Follow the road to the right and look for signs for the campground. There is easy hiking along the shore of the lake. You can also take the cross-country ski trail to the north that ends at the Ski Hill Parking lot. Hike # 4 and 5 Storm Lake Loop and to Goat Flats. Storm Lake is a scenic location beautifully framed among the soaring mountains. There are undeveloped campsites and there is good cutthroat and rainbow fishing in the summer from the shore and from car top bloats and float tubes. 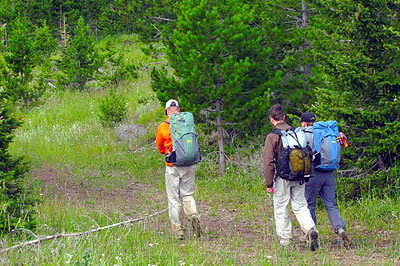 Snow tends to remain until mid to late June and even into July in heavy snow years, so hiking is best in the summer. Storm Lake also has a variety of wildflowers in early summer and is a good area for budding rock hounds. Take Hwy 1 toward Anaconda and make a right at sign to Storm Lake. Follow road for nine miles, bearing left at all forks. The last part of the road is rough and is best suited to high clearance vehicles. Once you get to the lake you can park wherever it is suitable. #4 Storm Lake Loop (Easy). The walk around the lake is the perfect easy hike that offers grand views of this alpine lake and the dramatic mountain setting. The hike is a little over a mile and relatively level. You will have to cross a marshy area as well as Storm Lake Creek. This isn’t a problem in the late summer, but you might get wet earlier in the season. #5 Storm Lake To Goat Flats (More Difficult). The hike to Goat Flats takes you up to the top of the mountains and offers spectacular views of the surrounding mountains and countryside. The trail is more difficult as it has steep grades and is at higher altitude. The length one way is 3.5 miles. From the dam spillway the trail follows the west shoreline. As you move along the trail look for a sign in box on the right and be sure to register. You are now in the Anaconda Pintler Wilderness and you will take the trail along a series of switchbacks gaining 1000 feet vertical and will emerge above the timberline. The trails follows the contours along the ridge to the windswept alpine meadow know as Goat Flats which offers sweeping vistas of various 10,000 foot mountains such as Queener Mountain, Mount Howe and Little Rainbow Mountain and views of Lower Seymour Lake. The trail ends at the intersection of the Continental Divide Scenic Trail. Hike 6 Carpp Lake Trail (More Difficult). This hike brings you to the 27-acre Carpp Lake overlooked by the 10,460 foot Warren Peak. The lake offers Westthroat cutthroats. The distance one way is 3 miles and there are some steep ascents and possibly a creek crossing. The altitude of Carpp Lake is 7,797 feet and the trail may not be accessible, depending on snowpack, until June. At the eastern end of the lake, turn onto onto Georgetown Lake Rd. Continue straight passing the turnoff for Upper Lake Rd where the road becomes Forest Service Rd. 672. (Note: this road is closed in the winter except for snowmobiling and other recreational activities.) Follow signs to East Fork Reservoir. Sign in at the trailhead registration box. Follow the trail across Carpp Creek where it intersects Carpp Creek Trail #24 at the Wilderness Boundry. Make a right onto the trail. After about a mile it will get steep. At about 2.7 miles from the trailhead you will pass the small, marshy, shallow Lower Carpp Lake. Continue another quarter mile to Carpp Lake. The following hikes are accessed off Skalkaho Rd. Take Hwy 1 north down the pass toward Philipsburg. Make a left at Skalkaho Rd. Hwy 38. Hike # 7 Fuse Lake Trail (Easy). This hike starts on an old reclaimed logging road, then winds through stands of lodgepole, then whitebark pine and ends at the 13 acre Fuse Lake which is surrounded on 3 sides by rocky cliffs. Fuse Lake is the only lake in the area that offers fishing for grayling. The distance one way is 2 miles. Take Skalkaho Rd. for approximately 25 miles. The Fuse Lake trailhead will be on the right near the top of the pass. Hike #8 Falls Fork Trail #29 Johnson or Edith Lakes (More Difficult). 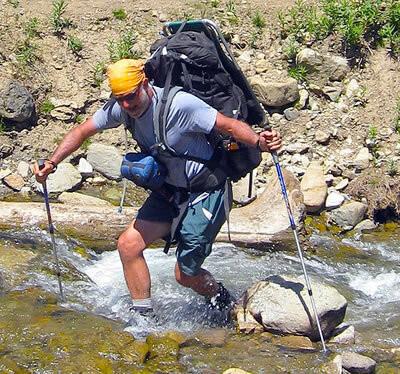 These 5 mile hikes have a stream crossing, switchbacks and rocky scree areas. To get to the trailhead take Skalkaho Rd. approximately 9 miles. Turn left on Moose Lake Rd. #5106 and go 15-1/2 miles to the trailhead. Sign in at the registration box. From the parking area the trail crosses the Middle Fork of Rock Creek over a stock bridge and into the Anaconda Pintler Wilderness as it climbs the Falls Fork of the Rock Creek drainage. There is a small waterfall along the route. After 3.3 miles the trail merges with the Hiline Trail #111. Turn right and proceed another 1.7 miles over rocky scree areas to the 45-acre Johnson Lake, which has good cutthroat fishing. If you take a left turn on the Hiline Trail it will bring you to the Edith Lake Trail, which branches off to the right and climbs a series of switchbacks to the hidden 33-acre Edith Lake. Anglers can fish for cutthroat and rainbows.